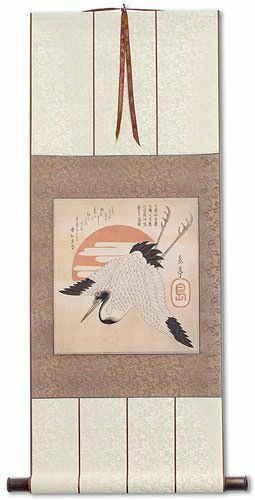 Artwork Panel: 28.3cm x 30.1cm ≈ 11" x 11¾"
Silk/Brocade: 37.5cm x 93cm ≈ 14¾" x 36½"
Width at Wooden Knobs: 46.5cm ≈ 18¼"
This features an Asian crane flying across the red disc of the rising sun at the horizon. I loved this image when I first saw it on the Metropolitan Museum of Art's website. This was a woodblock print created by 八島岳亭 (Yoshima Gakutei) back in about 1835. All of the prints were created so long ago that they all show a loss of detail and portions were clipped. I spent many hours working on the restoration of the image. You can now enjoy how this would have looked 183 years ago, but for a price you can afford. I also cheated a little, as the original was a little over 8" (20cm) wide. Mine is almost 30% wider, so it makes a better presentation on your wall. On the right, you will see the artist's given name, 岳亭, written vertically, in black characters. 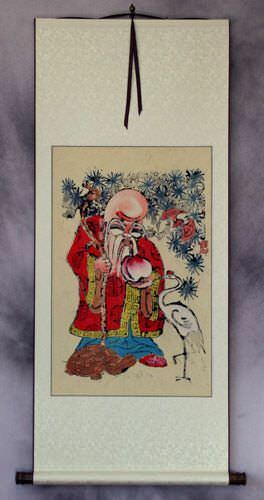 Below, a red stamp appears to be a circle around a 島 character. But the circle is actually a stylized 八 character (see the breaks at the top and bottom of that oval/circle? Those make it two strokes, hence 八). This is 八島 (Yoshima), the artist's surname portion of his signature for this piece. Upon first glance, some may think it's just a circle around 島 (Note: 島 means island by itself). 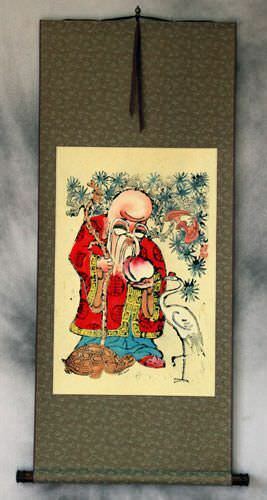 I have not found anyone who can translate the ancient Japanese poem on the upper left. The last characters on the far right are 倭和夛守. However, I am not sure of the third character. It seems to be a variant that is no longer used. It might be a variant of 多 or 尋, but nobody that looked at this was sure. Also not sure of the meaning, maybe a personal name. 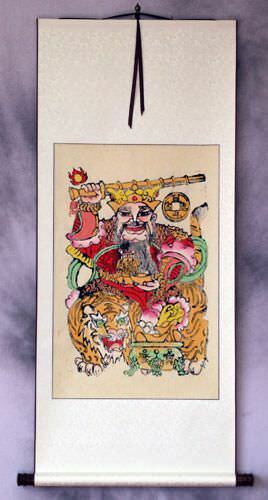 The artist is believed to be the illegitimate son of Samura Hirata under the Totugawa Shogunate. His mother later married into the Yashima Clan, thus the artist taking the surname Yashima. The unofficial Japanese title of this piece is 旭日飛鶴 (Kyokujitsu Hikaku) which means, "Sun Rising, Flying Cranes." 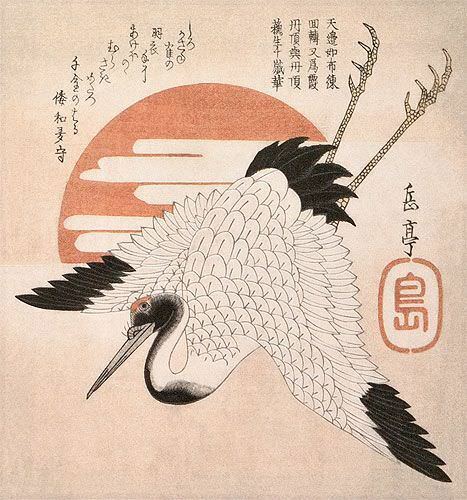 However, this same title is given to many images of cranes flying by a sunrise. For the best possible quality, I used my a $15,000 giclee printer with pigment inks for good UV resistance. This should last for 50 years if you don't hang it in direct sunlight. I printed this on handmade kozo (mulberry) paper, the same kind of paper used to make Japanese woodblock prints for centuries. 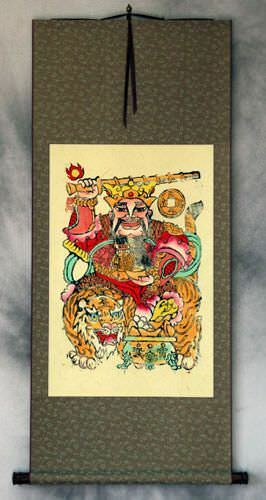 It was then sent to my workshop in Beijing where this handmade wall scroll was constructed. 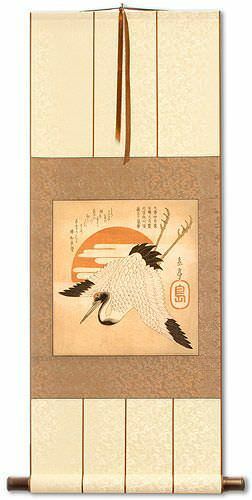 Just put a hook or nail in your wall and you have a classic piece of Japanese artwork. Between the many hours I spent restoring the image quality, printer cost, ink, other labor, and other materials, I will never make any profit on these, but it's a labor of love. I really like this image and wanted to bring it to the world.